What camera did I learn on? Discussion in 'Classic Manual Cameras' started by andrew_tefft, Sep 18, 2018. My first camera was a Boy Scout TLR in 620. My father was very careful about letting me shoot color. Too expensive. Later I used several of my father's cameras, both 120 and 35mm. 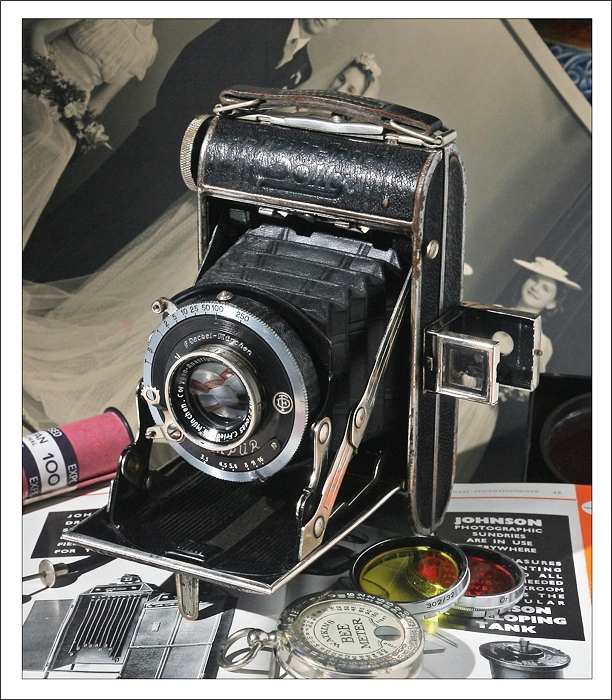 The first camera I purchased was an Argus C3. First SLR was a MInolta SR1s. First "pro" camera was a Koni-Omega Rapid M.
Funny that I had forgotten how my parents viewed the prohibitive price of color when I was a kid. Looking back at all of those instamatic family photos from the sixties, there was a definite tendency to shoot black and white except on “special” occasions. My first actual camera was a WIndsor 120 (Diana look alike) that I got in fourth grade for three Popsicle coupons and 65 cents. Then a Sears 127 (Imperial Cubex). Before getting my own 35mm I also had a Kodak Instamatic 124 and a Pocket Instamatic 40. My first 35 was a Konica Auto S2 that I bought from stock in the family camera shop while I was in high school. But I first learned using my Dad's Voigtlander Vitessa L, Mamiya Sekor 1000 TL and Konica c35. My first SLR was a Minolta SRT 201 that I bought during my junior year at Mississippi State University. The first 35 mm I ever used was my Dad’s AE-1. I chose the Pentax over it because of its smaller size and quieter shutter. My first camera was a Pentax ES II w/50mm f/1.4 Takumar that I bought new in 1974. I rapidly added lenses, but soon found out that having to unscrew the lenses to change them was a big pain. Also, I wasn't a big fan of the camera's averaging meter. I was hooked, though, and I traded everything in for a Leicaflex SL-2 and a few lenses. The "lollipop and stick" was used on quite a few Canon cameras. The FTb is probably best know, but it was also used on the TX, TLb, and AT-1. The original F-1 also uses this style meter, but it's in a separate window to the right of the viewfinder, and doesn't intrude into the viewfinder area as on the other cameras. Also, it didn't come in chrome . The New F-1 uses a very similar arrangement to the original F-1, but the "lollipop" indicates the aperture set by way of a scale printed on it. Sounds like a Minolta SrT. The SrT series has the meter needle on the right side but the OP may remember it wrong? The Yashica FX3 has a metal shutter but has a traffic light meter. Look, does it have to be that special camera... while I can imagine for sentimental reasons you want that one...but memories are poor judges....any number of the cameras suggested will fulfill the basic premise of 1977 ..I recommend you get a tank (Paterson) and some chemicals .. ie D76 in either liquid or powder form and some fixer either liquid or powder. Most folks don't bother with Stop bath these days Shoot the film with virtually any match needle SLR and develop the film. Then scan the negs and post here at CMC. The enlarger, paper and accompanying chemicals are quite an effort. You will find the paper expensive the rest relatively cheap....but you will need a Darkroom. Apropos Darkroom.... for loading the film in the daylight tank I use a changing bag. It just takes a little bit of practice. By scanning the negs you bypass the darkroom,enlarger, paper,trays chemicals etc. Actually these are my thoughts exactly. Going back a bit: I had shelved my long-loved Canon AL-1 several years ago, with digital being much more convenient for my needs at the time. My love of 35mm SLRs never died and I since have acquired a Yashica TL Electro-X, a replacement AL-1 (using the Yashica made me pick up the AL-1 again but it had exposure issues), and a Canon A-1 (needs some fresh lubrication - took it out in the winter and the shutter slowed way down!). I also have the chance to pick up some model of Iloca Rapid. At this point, with the A-1 being a major want for a long time (again for sentimental reasons) the ownership itch has been scratched and I do not really intend to purchase the camera of my youth; being able to identify it and read some blog posts from some Millenial who has recently discovered film and has used that model would be great though. Having had little luck getting my test roll from the A-1 processed locally I decided it would be fun to go back to Tri-X and start developing myself, since nowadays as you say the full darkroom is unnecessary. This is my intention and I've researched but haven't bought anything yet. As for the mystery camera - thanks everyone for your suggestions so far. Thank goodness for butkus.us since every camera manual has an illustration of the light meter, so I've been able to rule out everything so far. Only the Ricoh KR-5 has the right viewfinder view and metal shutter. The controls on top look familiar enough.Those details and the presence of a self-timer lever, are the ones I'm most certain of. So if no other contenders turn up, I'm willing to believe the KR-5, that it was actually new at the time and that I'm wrong about the discrepancies. Cool!! Andrew... then jump in ..water's fine!! I did that. It’s a hoot. Research your tool choices well before jumping in. Watch all the YouTube videos you can and ask questions. Practice spooling the film in the bag with a cheap practice unexposed roll. Download a developing app for info and timer. I always enjoyed photography, ever since I was a kid, but I always had miserable cameras. When I was a kid, it was a Kodak Brownie -- a Starmite, I think. Then a brace of 110 cameras that reached all the way through my 20s. I finally bought my first real camera when I as 29 -- a Canon AE-1. This was the camera that propelled me into my future as a photographer. Within a year, I'd bought an A-1. Less than a year after that, I bought my first FTb, which was the camera that really opened me up to photography. And then less than a year after that, I bought my first Canon F-1 -- a first generation original model. And it's been downhill ever since. Argus C3, & a GE 8DW58 light meter. Still have & use them. My first camera was the old family Kodak Jiffy 620. My first 'real' camera was a Honeywell Pentax H2. I 'shifted' to a Nikkormat FTn so I could use the PC-Nikkor 35mm perspective control lens. A long stretch of Nikons after that until the non-AI character of my lens collection pushed me to going digital on Canon EOS bodies (where the PC-Nikkor still worked just fine), I've posted here frequently on my personal histories with these cameras and others. I'm still learning, by the way. Possibly an Olympus OM-1? I know my old college used OM cameras for the students because they had manual functions, and were of good quality for a relatively low price. My "learning camera" was a Ciro-Flex model F TLR. I shot and developed lots of rolls of 120 Tri-X, enlarging and printing in my darkened garage. I think I had a Kodak Instamatic 100 or some variant in the 80s when you could still readily buy 126 film in drug stores. I then later had a 110 camera. In high school I had a Canon Ftb that was bought used at a camera store in town with the 50mm and wide angle lenses. It served me well for a while until I bought myself a used Kodak Retina Reflex III that I used in college for a couple photo classes I took. I've had in repaired/cleaned once and it has performed well ever since. I still use it regularly. Hard to beat those Schneider lenses! My father passed away rather unexpectedly when I was thirteen, and I inherited his Certo Super Sport Dolly camera, pictured below. I used it for about five years, and it taught me the basics of photography. I still have the camera, and while it's a little battered it's still in working condition. I actually started on digital and worked my way back to film, or rather a hybrid world of digital, film and scanners. Got into the game late anyway, and not the oldest visitor to this site. And I still love that moment the negatives come of the reel and you hold something physical you created - that alone will probably keep me shooting film.